These photos show the launch of my sternwheel paddleboat, "Taste of Being," from a 40 x 8 ft. trailerable on Friday July 27, 2001. The boat will have smokestack and railings before the Port Townsend Wooden Boat Festival the weekend after Labor Day (2nd wk. in Sept.), where the boat will be on exhibit. 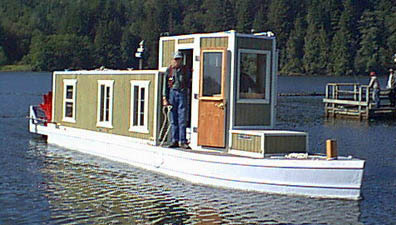 She's plywood with 2-3 layers of fiberglass, a 40 hp Westerbeke diesel 12.7 KVD gen-set with hydraulic pump on front. Hyd. "motor on wheel," 30 rpm., 8-1/2 in. draft at stern. Six bunks, head, galley, refrigerator/freezer and apartment-sized 4 burner 220v range with oven. Unbelievable first day. Two minor glitches, none interferring in whole three-day weekend of paddling around the lakes. I've kind of wanted a paddlewheel boat for a few years. 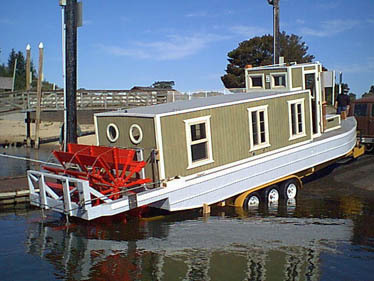 Got an I/O 26 ft. houseboat and tried it on the western rivers, but kept dinging props on the underwater submerged piling that are omnipresent out here from logging water-tow operations. Besides, it drew way too much water to run the sloughs and bays out here. Then saw an adv. in the Canadian version of Boat Buyer. It was trailerable. Flew up to Edmonton the next week fully intending to tow it home. However, the builder had fresh water in mind and used steel fasteners and mild steel angle iron. It wouldn't have lasted three months in Coos Bay's salt water! But the builder had a set of plans for sale. We bought them as a starting point and expanded from there. (They saved us a lot of time and money!) We started about Xmas on actual construction, two men working full time, so seven months keel to launch. Much still to be done. This is my first fully constructed boat, but have helped build boats for years, even getting into the ferro cement phase around this area. I am an ex-naval officer, ex Merchant Marine ship's master, and owned a charter boat operation in Coos Bay with 5-6 boats from 34 to 65 ft. This is my "last" boat. (I'm 64 yrs. old). Future plans for Taste of Being one include the Columbia river and after I retire Mpls. Minn. to New Orleans . . . .